With the numerous advances in technology impacting the jewelry industry, it can be difficult to keep pace. But the customer’s voice couldn’t be clearer – customization is here to stay. 40% of the bridal market and 15% of sales are completely custom pieces. 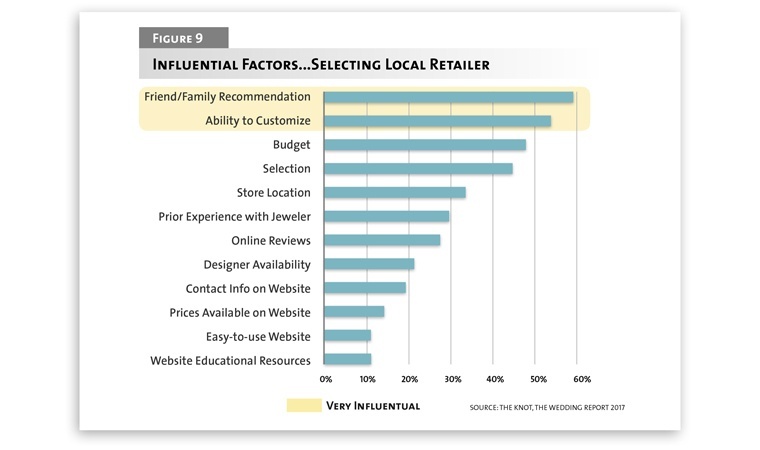 The second most influential factor in selecting a local retailer is the ability to customize, ahead of even budget, selection, and online reviews, according to a recent survey by The Knot. The key to growing your jewelry business is delivering what your customers want at the moment they want it. However, is investing in a 3D printing solution the best way to go? Before purchasing a B9 Core 550, Frank Kapplow, a wholesale jeweler and owner of Delmas Diamonds & Jewelers, watched as his fellow jeweler’s businesses one-by-one got shuttered their doors as production was shipped overseas. Soon, he too was faced with same difficult choice in order to reduce the cost of production and stay competitive. But rather than follow the trend, Frank decided to bet on his business, investing in our 3D printers instead. In just one day, Frank paid for his B9 Core Series by delivering on a $15,000 job, all while increasing his profit margin 30%. So how can our product fulfill your needs in jewelry? To answer that question, we've prepared a list of five ways that 3D printing can help you grow your business. 3D technology is transforming the jewelry industry in several ways. First, allows the user to take their entire business digital with an end-to-end jewelry workflow from a 3D scan to a CAD file all the way to having a 3D printed, ready-to-cast product. Not only are you providing the customer with a full, end-to-end solution – you’re doing it far more quickly than traditional methods like milling or costly alternatives like outsourcing. What would you think of having a model ready for try-on in 15 minutes? With B9Creations high-speed Gray resin, customers can choose a design that fits their needs, and while they go grab a cup of coffee, you can get the printer up and running to have a product for them to see, feel, and wear when they get back. With a 3D printer's ability to let you make a same day sale, customers can see their designs come to life over lunch, not overnight. An added benefit? The speed and versatility of 3D printing designs opens up an entirely new world when it comes to jewelry customization, not only for yourself but for your customers as well. The fast and easy-to-use prototyping capabilities of our 3D printers lets you troubleshoot the design of a piece without the need for a jewelry mold or wasting precious materials. And while bridal is big – custom is even bigger. When selecting a retailer from which to purchase a ring, the top two reasons are “friend/family recommendation” and “ability to customize,” according to a recent survey by The Knot. Both reasons were listed as “very influential” by more than 50 percent of respondents. The continuing importance of customization also becomes clear. 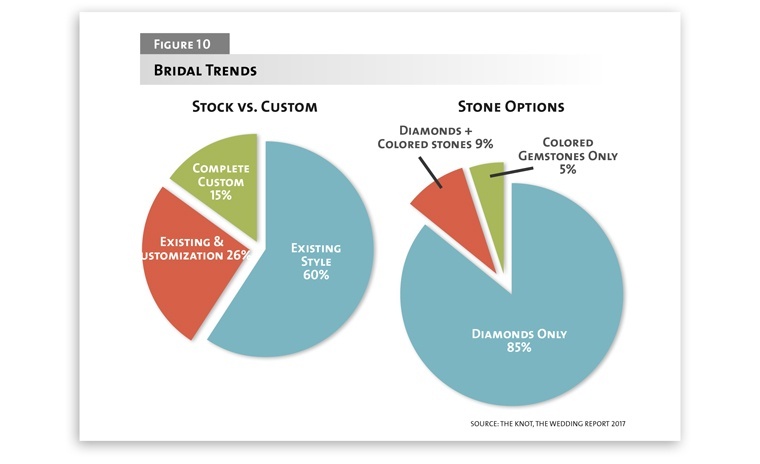 It now accounts for more than 40 percent of the bridal market: 15 percent of sales are completely custom, and more than a quarter consist of at least some personalization, as reported by MJSA. As we hinted at under same day sales, 3D printing is useful for design verification with high-speed resins that act as a sales tool – in the shop or at a trade show. Our castable models print quickly too without sacrificing surface finish for speed. An entire build table can take as little as 45 minutes, and leaves a super clean burnout and zero ash. To grow you have to think big, which means you’re not only saving time on individual jobs, you’re increasing your entire company’s rate of production with models moving from design to cast in a day. You can spend that saved time where it matters, growing your business and gaining more customer jobs at a faster rate. Perhaps the biggest financial gain that can promote business growth comes from reduced overhead simply printing your own models. But before we get to that, let's hypothesize for a moment and look at the effects of outsourcing model printing. 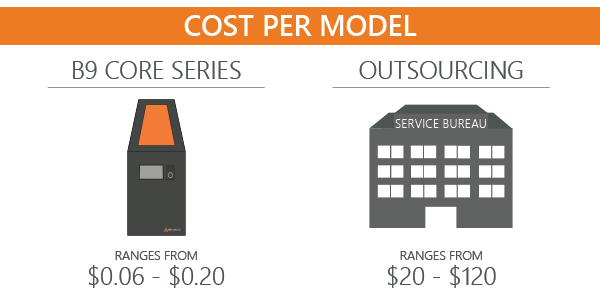 Neglecting time, consider the costs of having another company print your model, shown below. *This data factors in costs such as shipping, paying for the services, return shipping, and other factors, depending on the company. What’s a model cost to print on a B9 Core Series? $0.12. Even at the average cost of $40 model, you’re saving hundreds every week (not to mention the time lost to shipping and waiting in a service bureau’s job queue). Having a printer in house allows you to save a significant amount of money, especially when you produce ten or more models a week. We understand a 3D printer is a big investment, but at that rate, the machine pays for itself after 250 rings at an outsourced cost of $40 per model, with financing options that fit your business. To see more cost and time savings comparisons, check out our article on When to Buy a 3D Printer. When Kurt, a professional jeweler, walked into Irelia Fine Jewelry it was with a problem no one else could solve. He had a customer of his own, one wanting to replicate a soldier’s 60 year-old dog tag, a cherished family heirloom. Kurt had tried every method he knew, and none worked. Attempting silicon molds produced too thin of a model, and not one of the shops he had visited could find a way to get it done. Ready to give up, Irelia Fine Jewelry stepped in. They were able to use B9Creations 3D scanner, the B9 Scan 350, to produce a highly-detailed, identical replica of the dog tag heirloom. From there it was as simple as getting the file into CAD and then on a B9 Core 530 3D printer and pressing print. The B9 Scan 350 scanner and B9 Core Series 3D printer is a product combination that can help you gain those business deals you couldn't get any other way. Scanners can also be useful in reducing time when compared to the more common method of taking pictures in 2D and manually recreating the 3D model. In addition, scanners can also help with gemstone cutting. Having accurate dimensions of the gem assists in providing a more surefire way to replicate a gem. As I'm sure you know, cutting the gem wrong means the price of redoing it will come out of the company budget, so the importance of getting the gemstone cut right the first time cannot be overstated. Then it’s a quick 3D print of your custom setting to ensure a perfect fit every time. Ultimately, B9Creations is a company believes in providing innovative solutions that reduce time and production costs, while increasing throughput and business growth. We have offered solutions that have radically transformed businesses in the jewelry industry through 3D Printing technology that is affordable, fast, and reliable. Check out our Ultimate Guide to 3D Printing for Jewelry Businesses. In this guide you'll learn how 3D printing can help you overcome the biggest challenges you're facing, what to look for in a 3D printer, and when's the right time to buy - while helping you grow your business, serve customers faster, find the best ways to bring production in-house, and lower your operating costs.